Information requests specifically on flying boat guns, gun turrets, depth charges and rockets. This is the place to post photos, plans and documents to form an historical archive. Some of the later Catalinas had twin guns in a modified front turret. Does anyone have any information on said turret and did the Australian machines carry .303 or .05 inch guns in all positions? Any close-up pictures available at all? "I put the sweat of my life into this project, and if it's a failure, I'll leave the country and never come back". Howard Hughes, re: the HK-1 Hughes Flying Boat, aka the 'Spruce Goose,' 1946.
seawings wrote: Some of the later Catalinas had twin guns in a modified front turret. Does anyone have any information on said turret and did the Australian machines carry .303 or .05 inch guns in all positions? It was called the 'Eyeball' style turret by some and as far as I know the nose turret only mounted .30 caliber machine guns. As to the caliber used by the Aussies - I don't know. I'm sure our resident PBY Guru Mr. Legg will have an answer for all. I hope that this may be of some help. The drawing is not exactly the same as the turret in the photo. 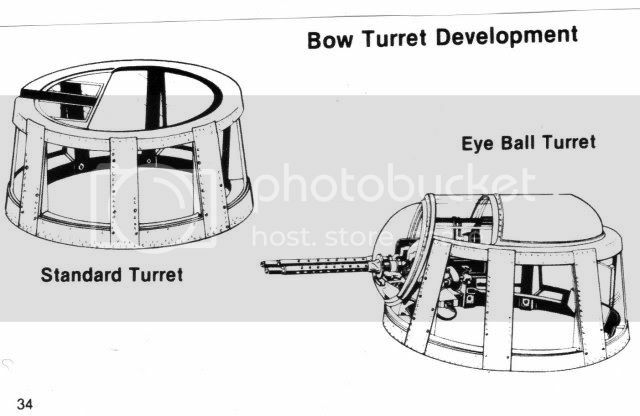 Not a great deal to add here as the diagrams above give a very good idea of the visual differences between the original and later style of bow turret. The rounded front end of the later turret was the reason why it became known as the 'eyeball' turret. Apparently this modification gave the gunner a better forward view and more protection. It also gave the gunner more headroom. The turret itself did not rotate on this version although the 'eyeball' did - overall however the angle of fire was reduced. The guns themselves were 2 x 0.30 machine guns. A later vedsion of the eyeball turret had a domed perspex rear to give the gunner even more headroom. The 'eyeball' turret was installed on Consolidated-built PBY-5As from serial BuAer46580 onwards and on all PBY-6As. 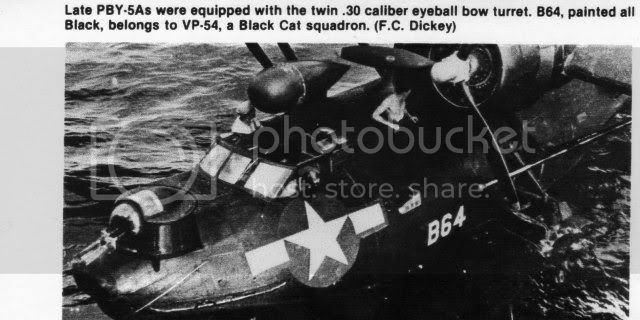 I have seen one source that says that some PBY-5 flying boats (ie: not amphibs) had 'eyeball' turrets but if that was the case it was not a standard fit. That said, many RAAF PBY-5As had eyeball turrets but the airframes were converted to flying boats by the removal of the undercarriages, the so called PBY-5A(M). They were installed on the Boeing of Canada-built PB2B-2, many of which served wih the RAAF. It is perhaps worth noting that the Naval Aircraft Factory PBN-1 Nomad, a modified version of the flying boat Catalina, had an entirely different type of bow turret bearing no resemblance to either the original PBY turret or the later 'eyeball' version. HI FOLKS - DAVID LEGG WOULD KNOW BETTER THAN ANYONE I THINK ON THE MIGHTY CATS - GREAT INFO FROM HIM - I ALSO REMEMBER SEEING A CAT WITH A 30 CAL THRO THE TUNNEL AT THE REAR OF THE KEEL -IS THAT CORRECT DAVID - ? - THANX J.C.